Non-coding RNAs: a key to future personalized molecular therapy? Continual discoveries on non-coding RNA (ncRNA) have changed the landscape of human genetics and molecular biology. Over the past ten years it has become clear that ncRNAs are involved in many physiological cellular processes and contribute to molecular alterations in pathological conditions. Several classes of ncRNAs, such as small interfering RNAs, microRNAs, PIWI-associated RNAs, small nucleolar RNAs and transcribed ultra-conserved regions, are implicated in cancer, heart diseases, immune disorders, and neurodegenerative and metabolic diseases. ncRNAs have a fundamental role in gene regulation and, given their molecular nature, they are thus both emerging therapeutic targets and innovative intervention tools. Next-generation sequencing technologies (for example SOLiD or Genome Analyzer) are having a substantial role in the high-throughput detection of ncRNAs. Tools for non-invasive diagnostics now include monitoring body fluid concentrations of ncRNAs, and new clinical opportunities include silencing and inhibition of ncRNAs or their replacement and re-activation. Here we review recent progress on our understanding of the biological functions of human ncRNAs and their clinical potential. A non-coding RNA (ncRNA) is a functional RNA molecule that is not translated into a protein. Members of this class of molecule are involved in many cellular processes and include highly abundant and functionally important RNAs, such as transfer RNA (tRNA) and ribosomal RNA (rRNA), as well as small interfering RNAs (siRNAs), microRNAs (miRNAs), PIWI-associated RNAs (piRNAs), small nucleolar RNAs (snoRNAs), promoter-associated RNAs (PARs) and the recently identified telomere specific small RNAs (tel-sRNAs). Moreover, the recent demonstration that other ncRNAs, the ultraconserved genes or transcribed ultraconserved regions (T-UCRs) , are involved in human carcinogenesis suggests that the broad family of ncRNAs contributes to molecular alterations in several pathological conditions. 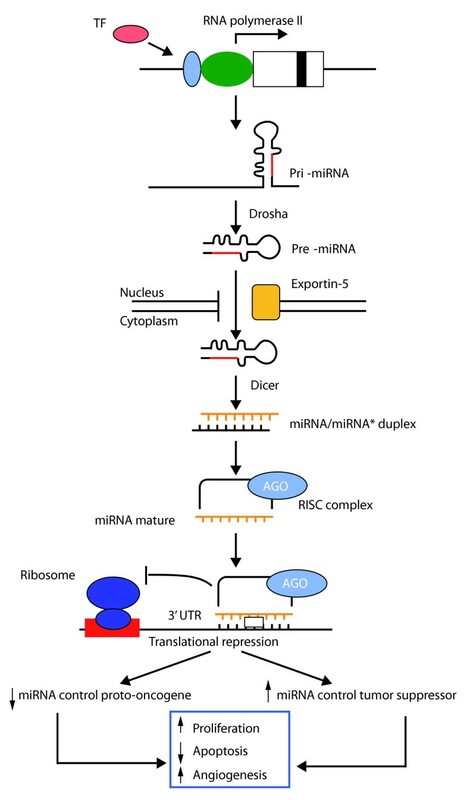 miRNAs are a conserved class of non-coding RNAs that regulate the translation of mRNAs (messenger RNAs) by inhibiting ribosome function, decapping the 5' cap structure, deadenylating the poly(A) tail and degrading target mRNAs . miRNAs are involved in mechanisms of gene regulation in both normal and diseased conditions and have a role during development, regulation of cell proliferation and apoptosis. The first miRNAs were identified in the nematode Caenorhabditis elegans as small RNAs that interacted with the 3' untranslated region (UTR) of the lin-14 mRNA to inhibit its expression . miRNAs are single-stranded RNAs 19 to 24 nucleotides in length generated through a complex maturation process [4, 5] (Figure 1). miRNAs bind mostly to mRNA segments originating from the 3' UTRs of genes , but the mechanism of translational repression is only partially understood. Schematic overview of miRNA processing and functions in cancer. Transcription from miRNA genes is under the regulation of transcription factors (TF) that respond to multiple signals and can also be epigenetically controlled. miRNA genes are transcribed by RNA polymerase II to produce a long nucleotide sequence, the pri-miRNA, which is cleaved by Drosha, a RNAse III endonuclease that recognizes internal hairpin structures. The resulting miRNA precursors (pre-miRNAs) of approximately 70 nucleotides are actively exported by Exportin-5 into the cytoplasm. Once in the cytoplasm, the pre-miRNAs are further digested by Dicer (another RNAse III endonuclease), which yields 21 to 22 nucleotide dsRNAs with two nucleotide overhangs (the miRNA* species is a rare non-miRNA cleavage product). Single strands from these dsRNAs associate with several members of the Argonaute (AGO) protein family to form the RNA induced silencing complex (RISC). The mRNA segments that miRNAs bind seem to be mostly in the 3' UTRs. Overexpression (up arrow) of a miRNA could result in downregulation of a tumor suppressor, or underexpression (down arrow) of a miRNA could lead to upregulation of an oncogene. These events thus promote cell proliferation, decrease apoptosis and stimulate angiogenesis, leading to tumorigenesis. siRNAs are small RNAs, 21 to 22 nucleotides long, produced by Dicer cleavage of complementary dsRNA duplexes. siRNAs form complexes with Argonaute proteins and are involved in gene regulation, transposon control and defense against viruses. piRNAs, 24 to 30 nucleotides in length, are produced by a Dicer-independent mechanism, associate with Piwi-class Argonaute proteins and are principally restricted to the germline and bordering somatic cells. piRNAs are important for transposon control [7, 8] and regulate chromatin state . A recent study suggests that an antisense RNA may trigger transcriptional silencing of a partner sense tumor suppressor gene; this effect occurs both in cis and in trans and is Dicer-independent. The biochemical mediators of this silencing involve a Piwi-like protein, and their role in mammals is just beginning to be understood [5, 10]. In zebrafish, piRNAs have been implicated in germ cell maintenance and many of them were mapped to transposons, suggesting that they have a role in silencing repetitive elements in vertebrates . At the moment, no relationships between piRNAs and diseases have yet been discovered. snoRNAs are small RNA molecules, approximately 60 to 300 nucleotides long, which generally serve as guides for the catalytic modification of selected ribosomal RNAs [12, 13]. In vertebrates, most snoRNAs have been shown to reside in introns of protein-coding host genes and are processed out of the excised introns. Many snoRNAs have been described as retrogenes . Some snoRNA is processed to a small RNA that can function like a miRNA . PARs encompass a suite of long and short RNAs, including promoter-associated small RNAs (PASRs) and transcriptional initiation RNAs, that overlap promoter regions. Their function is so far unknown but they may possibly regulate transcription, as exogenous PASRs have been observed to reduce expression of genes with homologous promoter sequences . tel-sRNAs in mouse embryonic stem cells are approximately 24 nucleotides long, Dicer-independent, and 2'-O-methylated at the 3' terminus. They are asymmetric, with specificity for G-rich telomere strands, are evolutionarily conserved from protozoa to mammals, and they may have a role in telomere maintenance . Ultraconserved region (UCR) sequences are longer than 200 nucleotides in the genomes of human, mouse and rat. These are DNA sequences absolutely conserved, showing 100% homology among species with no insertions nor deletions . UCRs can be located at fragile sites and genomic regions affected in various cancers called cancer-associated genomic regions. Genome-wide profiling has revealed that UCRs are differentially expressed in cancer and leukemia [1, 19]. Here, we discuss the basic mechanisms of action of human ncRNAs and review their clinical impact, including their emerging roles in the pathogenesis of cancer, leukemia and other diseases. We then focus on recent progress and future directions in drug development using the 'ncRNA strategy'. The identification of ncRNAs, in particular miRNAs and their respective targets, provides a host of potential biomarkers and novel therapeutic molecular tools. Several studies have shown an association between snoRNAs and various diseases, including cancer. Prader-Willi syndrome (PWS) is a congenital disease that is caused by the loss of paternal gene expression from a maternally imprinted region on chromosome 15. The SNORD115 snoRNA (also called HBII-52) shows sequence complementarities to the alternatively spliced exon Vb of the serotonin receptor 5-HT2C, located on chromosome X. HBII-52 regulates alternative splicing of 5-HT2C by binding to a silencing element in exon Vb. PWS patients do not express HBII-52, so in this case the snoRNA seems to regulate the processing of an mRNA located on a different chromosome . Furthermore, another study related to PWS  demonstrated that deletion of Snord116 (also called Pwcr1 or MBII-85) causes growth deficiency and hyperphagia in mice, revealing a novel role for an ncRNA in growth and feeding regulation. snoRNAs have also been implicated in cancer development. The U50 snoRNA acts as a tumor suppressor in human prostate cancer  and in the development and/or progression of breast cancer . There are 481 UCRs longer than 200 bases in the genomes of human, mouse and rat . Many of these elements have been shown to have tissue-specific enhancer activity [24, 25], and another subset of ultraconserved elements has been shown to be associated with control of splicing regulators by alternative splicing and nonsense-mediated decay . The functional importance of UCRs has been emphasized by genome-wide profiling, which revealed distinct UCR signatures in human leukemias and carcinomas. Calin et al. have shown that some UCRs, whose expression may be regulated by miRNAs, are abnormally expressed in human chronic lymphocytic leukemia (CLL), and that the inhibition of an overexpressed UCR induces apoptosis in colon cancer cells. The correlation between the expression of UCRs and miRNAs in CLL patients raised the possibility of functional pathways in which two or more types of ncRNAs interact. This implication may support a model in which both coding and non-coding genes are involved and cooperate in human tumorigenesis. The role of miRNA in cancer was first discovered in leukemia. Calin et al. reported evidence for the role of miRNAs in the pathogenesis of CLL: deletions and/or downregulation of miR-15a and miR-16-1 at 13q14 were associated with CLL. Cimmino et al. demonstrated that this cluster can regulate the expression of the B-cell lymphoma 2 (BCL-2) oncogene. Other relevant alterations of miRNAs in CLL include downregulation of miR-181a, let-7a, miR-30d, miR-150 and miR-92  and overexpression of miR-155. In Table 1 are shown the most important miRNAs associated with leukemia and hematological diseases. For example, miRNAs in the miR17-92 cluster are commonly amplified in B-cell lymphoma patients and, together with miR-155, they were among the earliest ncRNAs to be linked with cancer . miRNA expression signatures have revealed differences between acute lymphoblastic leukemia (ALL) and acute myeloid leukemia (AML) . Recently, specific miRNA signatures were correlated with karyotype alterations in AML: the main observation was that the t(15;17) translocation had a distinctive signature including the upregulation of a subset of miRNAs located in the human 14q32 imprinted domain. In another study, Garzon and colleagues  reported miRNA signatures associated with cytogenetics and prognosis of AML, with molecular abnormalities such as t(11q23), trisomy 8 and internal tandem duplications in the FLT3 receptor tyrosine kinase gene. Downregulation of miR-221 and miR-222 was observed in AML . Bueno et al. revealed a new dimension to the regulation of v-Abl Abelson murine leukemia viral oncogene homolog 1 (ABL1) expression by demonstrating that ABL1 is a direct target of miR-203. miR-203 is silenced by genetic and epigenetic mechanisms in hematopoietic malignancies expressing either ABL1 or BCR-ABL1. Restoration of miR-203 expression reduces ABL1 and BCR-ABL1 levels and inhibits cell proliferation. Venturini and co-workers  have shown the expression of the miR-17-92 polycistron in CD34+ cells in chronic myelogenous leukemia and the regulation of this cluster by BCR-ABL1 and c-MYC. Immediately after the first reports on the involvement of miRNAs in leukemia and lymphoma, a flurry of reports unveiled a role for miRNAs in solid cancers. The availability of high-throughput techniques for miRNA profiling allowed a detailed investigation of many cancer types. These studies immediately showed that miRNAs are differentially expressed in normal and tumor samples and can be used to classify tumors of different origins [35, 36]. Table 2 shows a summary of known miRNAs correlated with solid cancers. Some miRNAs that had been earlier characterized in leukemia were found to be commonly overexpressed in solid cancers: miR-17-5p, miR-20a, miR-21, miR-92, miR-106a, miR-107, miR-146, miR-155, miR-181 and miR-221/222 . Other miRNAs were characterized in relation to specific tumor types. For example, miR-21 was highly expressed in breast tumors  and a risk variant of a miR-125b binding site in the bone morphogenetic protein receptor type IB gene (BMPR1B) was also associated with breast cancer pathogenesis [38, 39]. The overexpressed miR-106b/93/25 cluster modulated an anti-apoptotic response after TGF-β stimulation mediated by BCL2-like 11 (BIM) . Various studies on pancreatic cancer highlighted significant differences between tumors and chronic pancreatitis, normal pancreas and pancreatic cell lines. Pancreatic tumors have a characteristic miRNA profile; a pancreatic ductal adenocarcinoma-related miRNA signature was defined . In a study on 65 resected pancreatic ductal adenocarcinomas with matched benign adjacent pancreas by Bloomston et al. , miR-196a was associated with poor survival. Several studies have shown that specific miRNAs are aberrantly expressed in malignant hepatocellular carcinoma compared with normal hepatocytes [43, 44]. The altered expression of some miRNAs has been associated with particular risk factors, such as hepatitis B virus infection or alcohol use . Many of these miRNAs are upregulated in hepatocellular carcinoma as compared with normal thyroid cells and hyperplastic nodules . By targeting and controlling the expression of mRNA, miRNAs can control highly complex signal-transduction pathways and other biological pathways. The biological roles of miRNAs in cancer suggest a correlation with prognosis and therapeutic outcome. A study  demonstrated that more than 50% of miRNA genes are located in cancer-associated genomic regions or in fragile sites, suggesting that miRNAs may be more important in the pathogenesis of human cancers than previously thought. miRNAs are also involved in advanced stages of tumor progression, which underlines their roles as metastasis activators or suppressors. There is emerging evidence that some miRNAs can function as either oncogenes or tumor suppressors. Those miRNAs whose expression is increased in tumors may be considered as oncogenes - also called 'oncomiRs' - which promote tumor development by inhibiting tumor suppressor genes and/or genes controlling cell differentiation or apoptosis. The miR-17-92 cluster is an miRNA polycistron located at chromosome 13q31, a genomic locus that is amplified in lung cancer and in several kinds of lymphoma, including diffuse large B-cell lymphoma. This cluster has been found to be regulated by c-MYC, an important transcription factor that is overexpressed in many human cancers . Microarray analysis revealed that miR-221, miR-21 and miR-181a/b/c are strongly upregulated in glioblastoma samples compared with normal brain controls . The data suggested that these miRNAs may act as anti-apoptotic factors in human malignant disease. In several types of lymphomas, including Burkitt's lymphoma, the expression of miR-155 is increased . Furthermore, miR-155 is located in the only phylogenetically conserved region of the B-cell receptor inducible (BIC) gene, suggesting that miR-155 may be responsible for BIC's oncogenic activity . Conversely, underexpressed miRNAs in cancers, such as some members of the let-7 family, may function as tumor suppressor genes by regulating oncogenes and/or genes that control cell differentiation or apoptosis. Several studies indicate that the RAS oncogene is a direct target of let-7, which negatively regulates RAS by pairing to its 3' UTR for translational repression, and some recent studies have focused on let-7 miRNA binding site polymorphisms in the KRAS 3' UTR that have been associated with reduced survival in oral cancers . Other miRNAs that have a potential role as tumor suppressors include miR-15 and miR-16, which induce apoptosis by targeting the mRNAs for the anti-apoptotic gene B-cell lymphoma 2 (BCL-2) , myeloid cell leukemia sequence 1 (MCL1), cyclin D1 (CCND1) and wingless-type MMTV integration site family member 3A (WNT3A) . Downregulation of these miRNAs has been reported in CLL, pituitary adenomas and prostate carcinoma. Restoration of miR-29b in AML cells induces apoptosis and dramatically reduces tumorigenicity in a xenograft leukemia model: this study also indicated that miR-29b targets apoptosis, cell cycle and proliferation pathways . miR-221 and miR-222 are two highly similar miRNAs whose upregulation has been recently described in several types of human tumors and for which an oncogenic role was explained by the discovery of their target p27, a key cell cycle regulator. The ectopic overexpression of miR-221 is able, on its own, to confer a high growth advantage to tumors derived from the LNCaP cell line in severe combined immunodeficient mice . In line with these results, treatment of established subcutaneous tumors derived from the highly aggressive PC3 cell line with the anti-miR-221/222 antagomiR (an anti-miRNA conjugated to cholesterol) reduced tumor growth by increasing expression of the cyclin-dependent kinase inhibitor p27 . These findings suggest that modulating levels of let-7, miR-15, miR-16, miR-221/222 or miR-29b might be of therapeutic potential in various different types of cancers. The first description of a miRNA in relation to tumor invasion and metastasis was by Ma et al. , who identified miR-10b upregulation in metastatic breast cancer cells with respect to the primary tumors. miR-10b was expressed in breast cancer in the following way: downregulated in cancer when compared with normal breast  but overexpressed in metastatic cancer when compared with non-metastatic tumors . Subsequently, Huang and colleagues  identified two miRNAs, miR-373 and miR-520c, that promote cancer cell migration and invasion in vitro and in vivo by blocking the adhesion molecule CD44. A significant upregulation of miR-373 and negative correlation with CD44 expression was found in breast cancer patients with metastasis. Recently, much interest has been focused on the role of miRNAs in the maintenance of the so-called 'cancer stem cells'. Human breast tumors contain a breast cancer stem cell (BCSC) population with properties reminiscent of normal stem cells. Three miRNA clusters, miR-200c/141, miR-200b/200a/429 and miR-183/96/182, are downregulated in human BCSCs, normal human and murine mammary stem/progenitor cells and embryonic carcinoma cells. miR-200c modulates expression of B lymphoma Mo-MLV insertion region 1 homolog (BMI1), an essential protein for the self-renewal of adult stem cells. miR-200c suppresses normal mammary outgrowth in vivo and tumorigenicity of human BCSCs. The coordinated downregulation of these miRNA clusters, and the analogous regulation of clonal expansion by miR-200c, provides a molecular link that connects BCSCs to normal stem cells . Because of their links to pathological conditions and, in particular, cancer development and progression, miRNAs and other ncRNAs might become useful biomarkers for diagnostic purposes. ncRNA expression levels can be determined by in situ hybridization, for example on a tumor section and its normal adjacent counterparts. Mature-miRNA-specific stem loop RT-PCR is an alternative detection system for very short ncRNAs. Recently, deep-sequencing technologies, such as SOLiD (Applied Biosystems, Foster City, USA) or Genome Analyzer (Illumina, San Diego, USA), have become available for high-throughput detection of ncRNAs. The key question is how to translate the molecular signatures determined in the laboratory to the clinical setting. As described above, several studies have identified associations of miRNA with disease prognosis, survival and mortality in biopsies (in pancreatic cancer  and colon cancer ). A possible innovative approach for early detection is represented by the determination of circulating miRNAs in plasma  or urine. In an application of this approach, Tanaka et al. have shown that miR-92a levels are decreased in the plasma of leukemia patients and suggested the ratio in plasma of miR-92a to miR-638 (the latter is stably expressed in human plasma) as a tool for the clinical detection of leukemia. Differential expression of miRNAs in plasma of patients with colorectal cancer has also been proposed as a basis for screening . Non-oncological disciplines could also benefit from measuring circulating ncRNAs. For example, the plasma concentration of miR-208 might be a useful indicator of myocardial injury . Plasma miRNAs and other circulating or secreted ncRNAs therefore represent potential novel biomarkers for early detection of various pathological conditions. The fundamental roles of miRNAs in development, differentiation and malignancy suggest that this class of molecules are potential targets for novel therapeutics. Antisense oligonucleotide approaches, used for inhibition, and siRNA-like technologies, used for replacement, are currently being explored for therapeutic modulation of miRNAs. There are currently several approaches to silencing ncRNAs (Table 3). Most of these methods have been applied to miRNAs, the class of ncRNAs that currently holds the highest potential for clinical applications. Specific knockdown of miRNAs by anti-miRNA oligonucleotides (AMOs), double-strand miRNA mimetics and overexpression of miRNA duplexes have been conducted in vitro and in vivo (Table 4). AntagomiRs have been found capable of inhibiting specific miRNAs in mouse models. RNase H-based AMOs, which work primarily in the nucleus, may be useful for targeting polycistronic pri-miRNAs, such as the miR-17-92 cluster . Elmen et al. showed that systemic administration of 16-nucleotide unconjugated locked nucleic acid (LNA)-AMO complementary to the 5' end of miR-122 leads to specific, dose-dependent silencing of miR-122 with no hepatotoxicity in mice. Another study from the same group demonstrated that the simple systemic delivery of an unconjugated LNA-AMO effectively antagonizes the liver-expressed miR-122 in non-human primates. Acute administration by intravenous injections of 3 or 10 mg/kg LNA-AMO to African green monkeys resulted in uptake of the LNA-AMO in the cytoplasm of primate hepatocytes and formation of stable heteroduplexes between the LNA-AMO and miR-122 . This route seems attractive for in vivo applications that are inaccessible to RNA interference technology, such as inhibition of oncogenic miRNAs. *Abbreviations: GFP, green fluorescent protein; CMV, cytomegalovirus. 1C3'-endo (beta-D-LNA) or C2'-endo (alpha-L-LNA) stereoisomer. *Abbreviations: CDK, cyclin-dependent kinase; E2F, E2 transcription factor; LPS, lipopolysaccharide; Plk1, Polo-like kinase 1; SCID, severe combined immunodeficient; SHIP1, Src homology-2 domain-containing inositol 5-phosphatase 1; TLR, Toll-like receptor. Strategies based on synthetic miRNAs may also open interesting avenues. Recently, Tsuda et al. [64, 65] designed and developed synthetic miRNAs corresponding to duplex miRNAs by introducing 3-nucleotide loops in GU-rich regions of the 3' UTR sequence of the glioma-associated antigen-1 (Gli-1) gene. They found that one of these (Gli-1-miRNA-3548) and its corresponding duplex (Duplex-3548) inhibited proliferation of Gli-1+ ovarian and pancreatic tumor cells. An alternative to chemically modified anti-ncRNA oligonucleotides is offered by de novo engineered ncRNA inhibitors that can be exogenously expressed in cells. These 'miRNA sponges' are competitive inhibitors to transcripts expressed from strong promoters, containing multiple, tandem binding sites of an miRNA of interest. Sponges inhibit miRNAs with a complementary heptameric seed, such that a single sponge can be used to block an entire miRNA family with the same seed. Fluorescent reporter genes can be used to identify and sort the treated cells . Another route to therapeutic targeting of ncRNAs, in particular miRNAs, could be represented by inhibition of Drosha, Dicer or other components in the maturation pathway. This method, stepping into a pleiotropic physiological pathway, may, however, be difficult to make specific in its therapeutic effect. When ncRNA activity is lost in affected cells, an alternative therapeutic strategy is needed. Here the approach is represented by the 'replacement' of defective or absent RNA effectors. An example of such an approach is the use, as described earlier for the miR-29b tumor suppressor, of synthetic oligonucleotides, in this particular case aimed at improving treatment response in AML . Gene therapy approaches for therapeutic miRNA replacement hold considerable potential. Modified adenovirus or adeno-associated virus vectors have been effective for gene delivery into tissues. Nevertheless, a study  has also shown that such an approach can cause fatality in mice, possibly resulting from oversaturation of the cellular miRNA/short hairpin RNA pathway (shRNA; a short sequence of RNA that makes a tight hairpin turn and can be used to silence gene expression). Lentiviral delivery of short hairpin RNAs is another system for the delivery of shRNA constructs (controlled by either RNA polymerase II or III promoters) designed to mimic the pri-miRNA by including the miRNA flanking sequence into the shRNA stem [68, 69]. The multi-inlet focusing technique used for the Bcl-2 antisense deoxyoligonucleotide  can be extended to condense miRNA and overcome the challenge of limited transfection efficiency faced by delivery of 'naked' miRNAs. Moreover, epigenetic modifications of miRNAs, such as methylation, suggest the use of epigenetic therapy with drugs that modulate DNA methylation or histone deacetylation. Activation of tumor suppressor miRNAs, such as miR-127, by chromatin-modifying drugs may inhibit tumor growth through downregulation of their target oncogenes . ncRNAs represent a novel kind of human post-transcriptional regulatory tool. They can specifically target different genes, often in a one-to-many manner. Fine-tuning the level of a single ncRNA might therefore affect many pathways in a pleiotropic manner. Several studies have contributed to our understanding of the functions of ncRNAs and of their impact on the pathogenesis of complex diseases. Abnormal miRNA expression is now regarded as an intrinsic feature of cancer growth and progression. These observations highlight the clinical potential of ncRNAs as biomarkers for diagnosis, prognosis and prediction of therapeutic outcome. Because of the significant impact of miRNAs, it would be useful to develop a personalized expression dataset such as a 'molecular diagnostic database'. The new deep sequencing technologies might here provide the ability to translate laboratory potential into clinical practice. Inhibition and re-activation of ncRNAs will then be the final steps in this discovery chain, leading to a therapeutic approach. Engineered synthetic miRNAs could be custom-applied to specifically regulate gene expression based on the patient's genomic profile. SV is supported by AIRC (IG 8588), PRIN MIUR 2008 and Regione Emilia Romagna PRRIITT BioPharmaNet grants. MG, MES and SV mined the literature and discussed and wrote the manuscript.